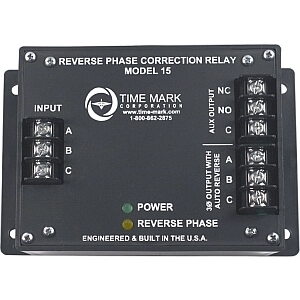 The Model 153 Reverse Phase Relay is designed to continuously monitor phase rotation of 3-phase lines. This device should be used in applications where proper phase rotation is critical, such as fan motors, compressors, grinders, elevators, etc. The solid-state sensing circuit drives an internal electromechanical relay which energizes when power, with correct phase rotation, is applied. 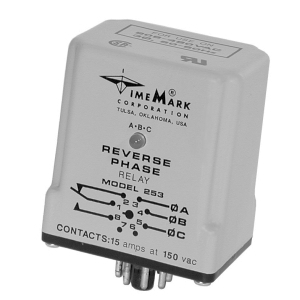 The relay will not energize if the applied phases are reversed. It will de-energize if phase rotation is reversed while the motor is running. An LED indicator will illuminate with correct ABC phase rotation. 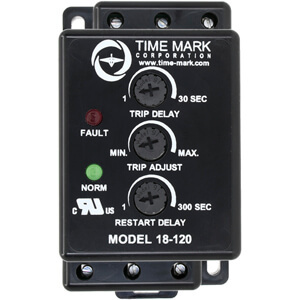 The Time Mark Model 15 was designed to protect your valuable equipment from the damaging effects of phase reversal by sensing and automatically correcting for phase reversal. Under normal power conditions, incoming A B C voltage is passed straight through the device to the A B C output terminals (4 amps @ 480 VAC resistive max). If the unit detects an incoming reverse phase condition (C B A), it will light the reverse phase LED and internally switch 2 of the phases and then pass the corrected phasing out to output terminals A B C. If your load is higher than 4 amps @ 480VAC resistive, the Model 15 provides an auxiliary output relay to put in the control circuit of a remote reversing contactor. If phasing is correct, the relay will remain in the static condition (N.C contact will remain closed and N.O. will remain open). If the Model 15 detects a reverse phase input, the auxiliary output relay will energize and the relay contacts will switch (N.C contact will open and N.O. will close). 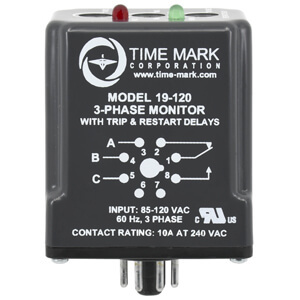 The Model 253 Reverse Phase Relay is a solid-state sensing device designed for installation in equipment using 3-phase power. This unit is used where it is desirable to have a contact closure indicating that the proper phase rotation sequence has been applied. The relay closes when the proper sequence (ABC) is applied, but will remain open if any two phases are reversed. If reverse phasing occurs during operating, the relay also de-energizes. 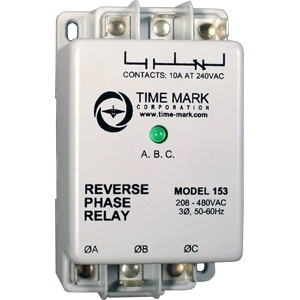 The Model 253 has a special industrial-grade relay designed for low power consumption. The ABC indicator will be illuminated when the proper phase rotation sequence is applied.